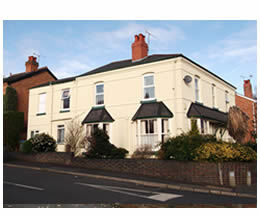 Safeharbour, 52 Corbett Avenue, Droitwich Spa is a large victorian detached property in a residential area of Droitwich, approximately one mile from Droitwich town centre. Droitwich is in Worcestershire, Worcestershire offers a large range of facilities and amenities in this area. The house has five bedrooms, two ground floor and three first floor rooms. All bedrooms have pipework for ensuite facilities (should this meet the needs of the service user). There are two large bath or shower rooms (one on the ground floor and one on the first) and other toilet facilities. Safeharbour has a large lounge with furnishings and entertainment facilities, as well as extra areas for dining, a dining room, conservatory and bright, spacious kitchen on the ground floor. To access the first floor, there is a stairway from the main hall and lift towards the rear of the property. These lead to the three remaining bedrooms, bathroom and sensory room. At the rear of the property, there is a small paved area with raised flower beds, summer house (to serve the needs of one service user) and shed. The wooden gate provides privacy to the service users when they use the garden. Safeharbour can accommodate five people. All bedrooms presented are fourteen square metres or over (see house map). Each bedroom is for single occupation. This conforms to the standards laid down in the Health and Social Care Act 2008.